My friend Salinger says that rush jobs yield the best results. I think he is wrong, but he might be right in this case. This was a major rush, but I think it turned out pretty, pretty good. The colors are a little washed on line, but I don't have time to correct them for the web right now. It's for an event called the Mission Arts & Performance Project (MAPP) in San Francisco. I think it might be the coolest thing I am ever involved with. 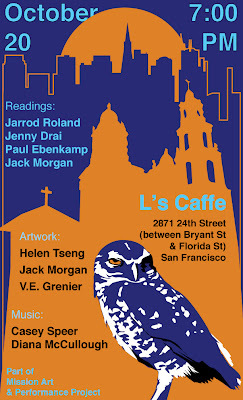 There will be poetry read by Jack Morgan, Jarrod Roland, Paul Ebenkamp, and Jenny Drai. There will be music played by Diana McCullough and Casey Speer. There will be art displayed by V.E. Grenier, Helen Tseng, and Jack Morgan.